the obsessive imagist | art, design, life: 70TH BIRTHDAY BONANZA: DRINK UP! 70TH BIRTHDAY BONANZA: DRINK UP! More updates from the party! As you may recall, we decided on a nautical theme since we were hosting it at our cottage on the Connecticut shoreline. So most of our decorations played on a color scheme of red, white, navy and sunflower yellow. I had these red and white striped straws with the "bottom's up!" and "cheers!" flags left over from the wedding, but I wanted to jazz them up a little bit and make them more seaworthy for the party. 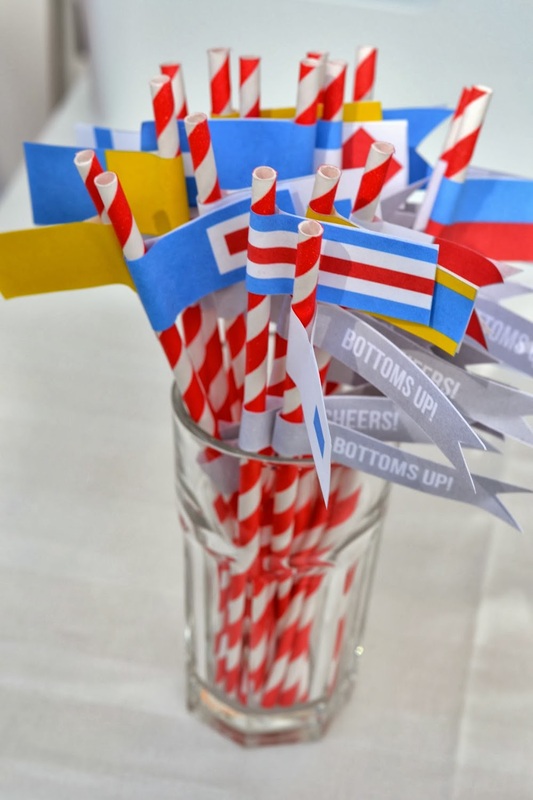 I decided to design some 'signal flags' to add to the straws and use as wine glass labels. I think they came out pretty well, no? Should you be so inclined, you can download a pdf of my designs here. You can either print both sheets out on sticker paper (like this) and cut the flags out, or you can print the first page (the straw flags) on regular paper and attach them to the straws with double-sided tape. p.s. I also decided to fancy up the Le Pens I bought with a loop of this chevron red ribbon. Plus it has the bonus advantage of helping you spot loose pen caps at the end of the night! p.p.s. These scalloped cards make really cute party signs!